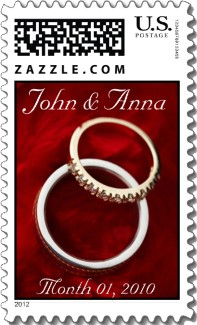 Colorful Wedding Postage to Complement Your Colors. Click Any Color Category Below to Get Started. The first thing you did was to pick your colors. 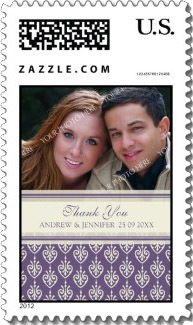 It is easy to match your colors on your wedding invitation with any of these customized stamps by color category. From the deepest purple wedding colors to the sunniest yellow wedding colors, you will find your perfect wedding invitation stamp. 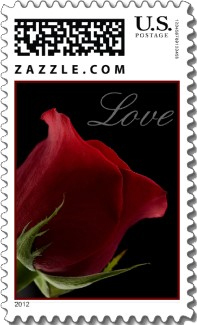 A red rose is synonymous with love and this red rose wedding stamp includes both a sharp beautiful rose and the text. 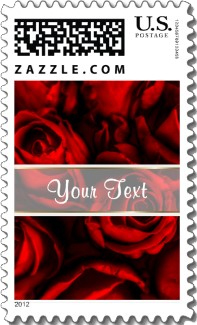 This bouquet of long stemmed red roses make a dramatic and elegant red wedding stamp. A timeless symbol of love and passion. Personalize It! Easily add you text to the screened banner in the center. Vivid textured red background with two overlapping wedding rings. Personalize It! Easily add your names above and your date below on this red wedding stamp. 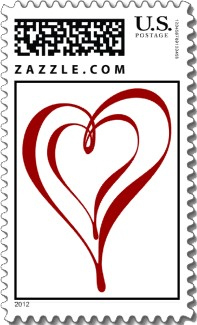 Wonderfully simple and compelling red wedding stamp. Personalize It! Include your names in a swirly script font in black against a white background. Two overlapping stylized red hearts complete the image. Beautifully simple and stylish red wedding stamp. Variable red background with a swirly script font for the text "love" in the lower right. Two faint gold overlapping frames complete this impressive red wedding stamp. The red ribbon at the top of this red wedding stamp is embellished with snowflakes. Tied off with a red bow with a diamond in the center. Personalize It! Substitute your names and date in the lower silver area. Close in portrait of a dark red long stemmed rose fills the the left side of the frame of this red wedding stamp. The text "Love" in a swirly script soft gray font in the upper right. Stylish. 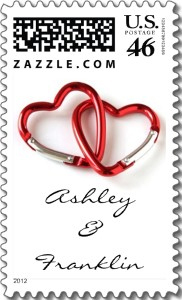 This red wedding stamp has two red interlocking carabiners on a white background with your names in a black swirly font. Truly unique and appropriate for couples who enjoy the outdoors and mountain climbing. 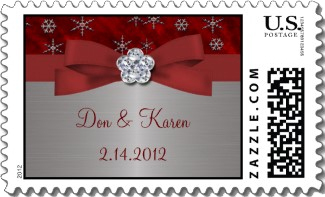 Colorful and rustic red wedding postage stamp. Red Gerber Daisy against dark weathered wood customized with your names. Simple and lovely. Red swirly florals in two opposite corners with a small red heart in the center. Personalize It! Easily include your names on either side of the heart. A red wedding stamp that will work for any invitation design. 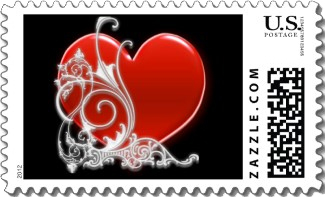 The black background of this red wedding stamp dramatically sets off the large red 3D heart with a swirly white scroll overlay. Very nice. 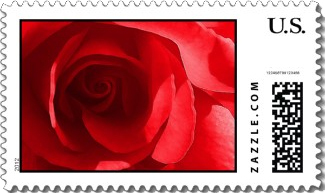 This red wedding stamp is a close in view of a crisp fresh red rose with wonderful highlights. Visually strong. 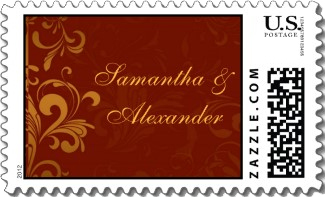 Brick red wedding stamp with swirly gold scrolls to the left. Personalize It! Include your names in a gold script font on the center right. Two sparkling silver wedding rings with a scattering of small red hearts and the text "Love" in a red swirly font in the lower right. Simple and lovely. Attractively simple design of two overlapping red 3D red hearts on a white background with no frame. Perfect for all wedding correspondence. 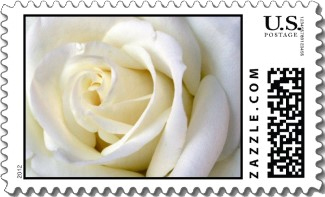 The frame of this white wedding stamp is filled with a close up view inside a sugary white rose with the white text "Our Wedding" against a gray band. Personalize It! with your names at the bottom. 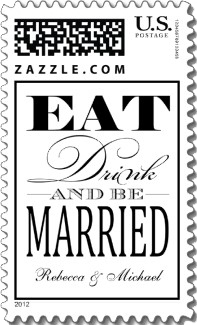 This white wedding stamp is all fun text "Eat Drink and be Married" in a variety of well chosen fonts. White wedding sandals and a white garter with a soft pink band at the bottom to hold the white swirly text "Bridal Shower". 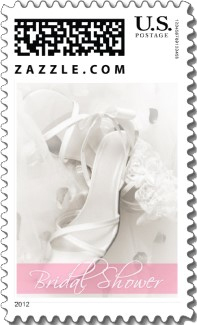 Very feminine white wedding stamp. Cute line drawing in black and white of the prospective groom proposing on one knee. 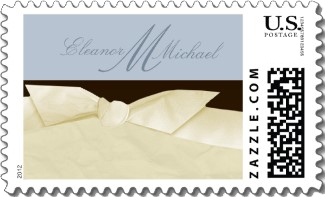 Sweet white wedding postage stamp. Sugar white rose with subtle highlights and shadows. 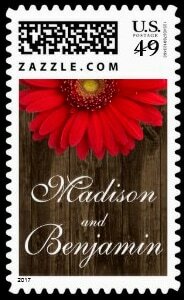 Classic and stylish white wedding stamp. Two platinum silver wedding rings are tied together with white ribbon and the text "Love" in the lower right in silver. 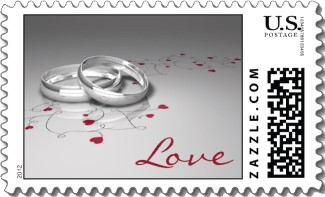 A wonderful white wedding stamp. Wonderfully sparse and compelling illustration of a bride and groom looking into each others eyes. 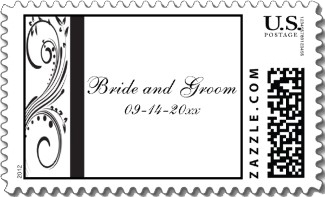 Very classy black and white wedding stamp. 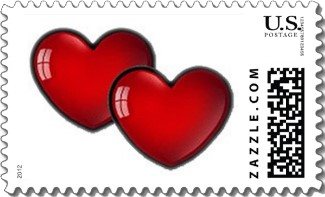 Two swirly red hearts one inside the other fill this white background wedding stamp. 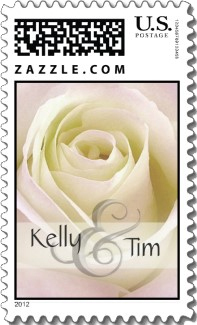 White rose with hints of pink fill the background of this white wedding stamp. Personalize It! Easily revise with your names. Formal, classy and stylish with tapering illustrations of a bride and groom in formal wear. 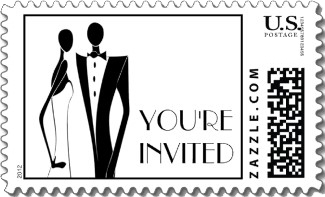 "You're Invited" in a Parisian black block font in the lower right. Retro wedding stamp. 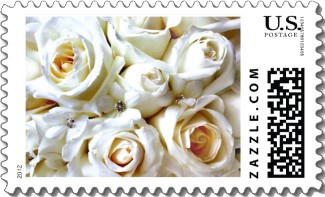 The tops of a dozen white roses fill the frame of this white wedding stamp. Classic. Customize It! Easy add the text of your choice. 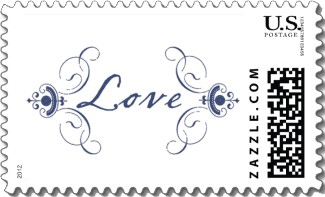 Simple and stylish white wedding stamp with blue script "Love" between two blue swirly scrolls. Stylish simplicity. Contemporary black on white wedding stamp. Swirling scroll on the left is set apart by a vertical black band. Personalize It! Easily add your names and date to the right side panel. Simple black and white wedding stamp with a splash of color. Personalize It! Easily put your monogram inside the pink square and include your names in the black swirly font on top. 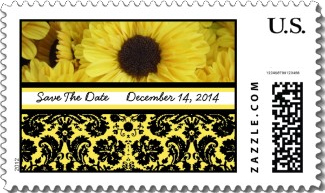 Elegant and modern Save the Date white wedding stamp with combinations of black fonts. Personalize It! Easily revise with your date and names. Personalize It! 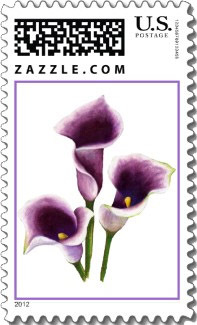 Beautiful pink calla lily wedding stamp. Simply enter your names in the space provided. 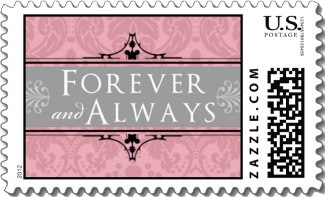 Pink is the standout color of this wedding stamp. Pink frame with a pink bow tie dividing the frame in half. Black floral scrolls against white on top and Customize It! Change the lower pink text as you wish. Delicate pink rose wedding stamp. Sharp and detailed up close photo of a pink rose. 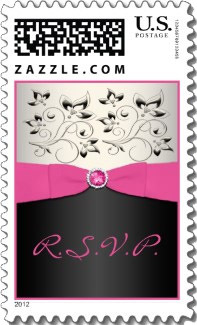 Pink floral pattern forms the background of this pink wedding stamp. A gray banner with scrolling surround holds the white text "Forever and Always". Touchingly sweet. 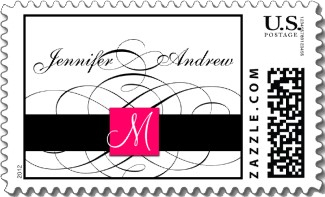 Classic style with this black and pink wedding stamp. Upper third has a black and white pattern set apart by a pink stripe. Personalize It! Easily add your names in white against the bottom black backdrop. 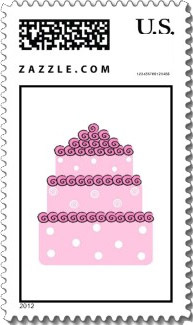 A popular perfectly pink postage stamp. Pink background and the white text "Love" in a swirly script. 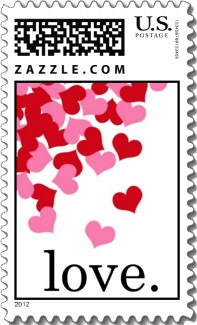 Very nice love postage stamp. Illustration of a pink wedding cake with white and pink rose frosting. 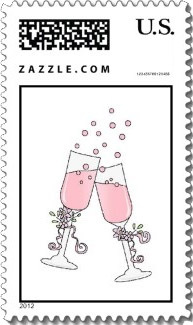 A simple and fun pink wedding stamp. 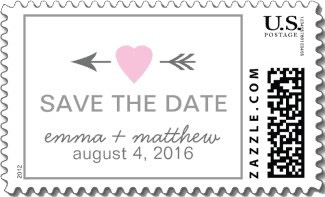 Spilled red and pink hearts fill the upper left corner of this pink wedding stamp. The word "love" in lowercase black at the bottom. Simple and attractive. Careful line drawing of two toasting champagne glasses filled with pink champagne giving off pink bubbles. Stems decorated with pink ribbon. Tastefully simple pink wedding stamp. 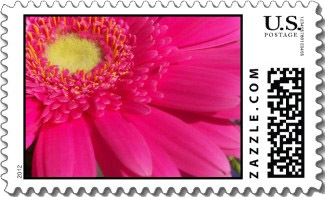 Vibrantly pink gerber daisy fills the frame of this wedding stamp showing the yellow interior of this beautiful flower. 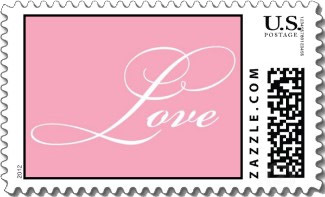 This soft pink wedding stamp has a pink engraved font for the word "Love" surrounded by swirly scrolls. Stylish. Perfectly pink rose background with your names and the date. 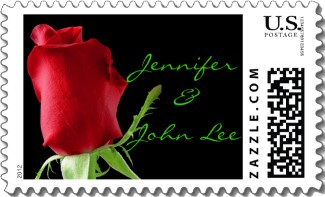 Wonderful pink rose wedding stamp. Pink heart with gray cupid's arrow above the text "Save the Date". Personalize It! Change that text, add your names and your date. 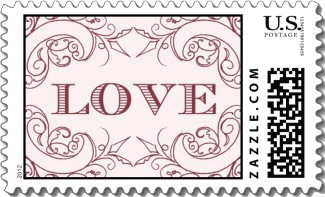 It's very easy to make this pink heart wedding stamp yours. 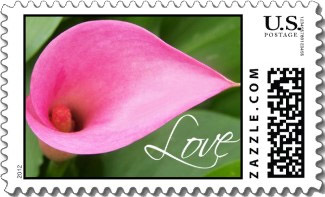 A pink calla lily wedding stamp. The lily nearly fills the frame with its greenery as the backdrop and a swirly script font for "Love" in the lower right corner. Chic. Inside a blushing pink orchid background with the script text "Our Wedding" in the foreground. 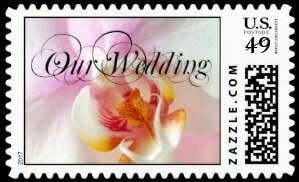 Captivating orchid wedding stamp. This arrangement of sweet and simple blue orchids on this wedding stamp will be a wonderful match for blues of any color. Blue ribbon with two joined sparkling white hearts and blue floral swirls at the top. Personalize It! The RSVP text is easily changed to whatever you like. Matching invitations and more. Two blue interlocking ribbon hearts and two wedding rings on a blue ribbon. 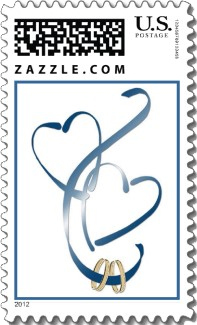 Very simple and swirly blue wedding postage stamp. 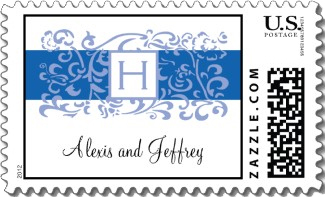 This wedding stamp has an elegant cream and blue with a light blue banner on top. Personalize It! with your names and monogram. 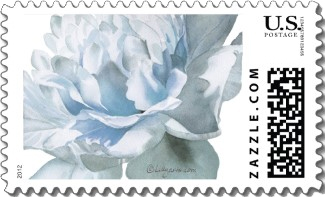 Beautiful soft blue silver grey peony wedding postage stamp digitally enhanced from an original watercolor painting. Stunning on any of your wedding mail. 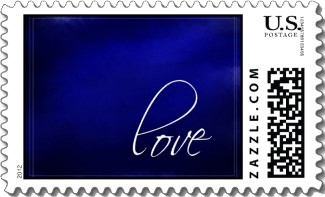 The dark to light blue background makes the white swirly text "Love" really pop on this blue wedding stamp. 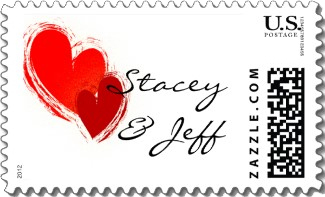 A swirling blue wedding stamp personalized with your names and date below two jeweled hearts. Simple and elegant. 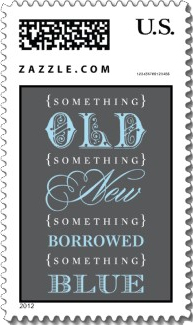 Stylish wedding postage stamp features "Something Old, Something New, Something Borrowed, Something Blue" verse. Charcoal gray, white & aqua blue colors. Wonderful. 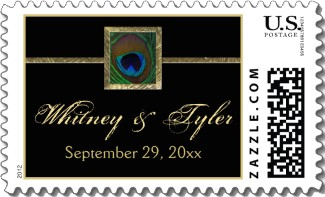 This elegant peacock wedding stamp can be personalized with your names below the text LOVE in a vintage font. 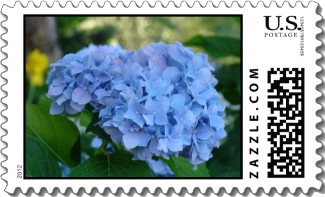 A flower choice for many weddings, this blue hydrangea wedding stamp helps tie it all together. Natural outdoor background. A strong blue band running across this blue wedding stamp is the background for swirling florals. Personalize It! Include your monogram and names in soft gray against white near the bottom. 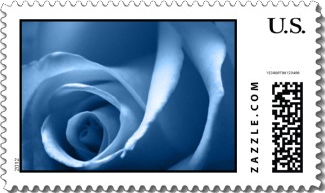 A close up view of the inside of a soft blue rose with highlights. 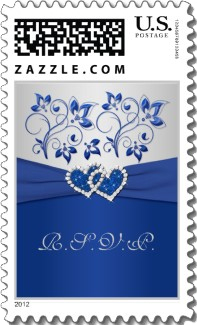 Stylish blue wedding stamp. 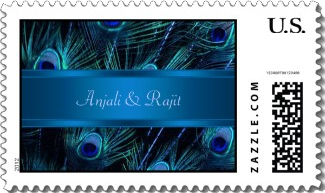 The background of this blue wedding stamp is blue peacock feathers. An elegant blue shining ribbon across the foreground. Personalize It! Easily include your names. 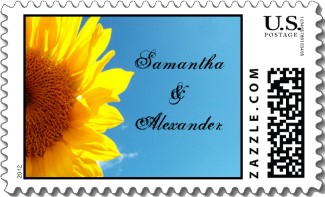 A wedding stamp with sunflower motif against a brilliant blue sky. Personalize It! Easily add your own names to this happy design. Personalize It! 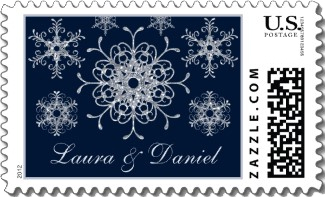 This navy and silver gray glitter snowflake wedding postage stamp makes it easy to includes your names. Matching wedding invitations for a beautifully coordinated look. 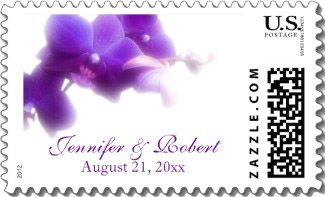 Purple August wedding stamp with beautiful iris against a natural green background. An elegant bottom band balances the design while emphasizing the text. Personalize It! 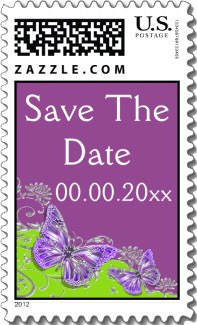 Easily change all the text on this predominantly purple wedding postage stamp. Light green "spill" at the bottom left with purple and silver butterflies. Perfectly purple orchids build a frame in the upper left. Personalize It! Your names and date in purple at the bottom center against a white background. An all purple background contrasts with white scrolls above and below the white text "Celebrate" in a swirly script font. 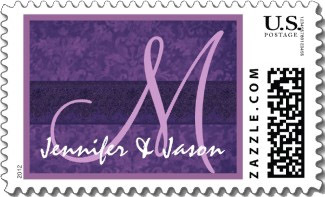 Stylishly simple purple wedding stamp. 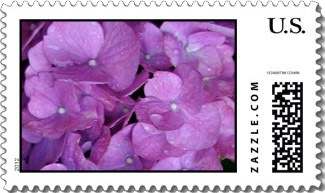 A close up of a beautiful purple hydrangea that fills the frame of this purple wedding stamp. Perfectly painted Picasso lilies with their purple interiors, ivory exteriors, green stems and a hint of yellow inside. 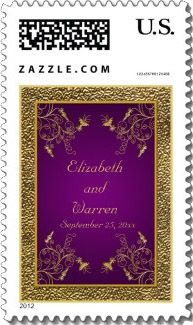 The wedding stamp's purple border provides the proper accent with the white background. Personalize It! 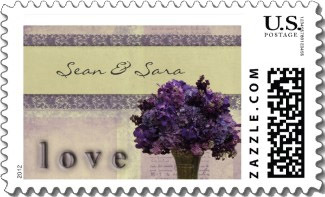 Easily add your photo to this ivory and purple wedding stamp. The "Thank You" text can be changed to "Save the Date", or anything you want. Plus add your names and date. Very sweet and versatile. Purple and silver damask background with a transparent white band framed with silver borders. Personalize It! Your choice of text. Old fashioned vase of purple and pink lilacs wedding stamp. Personalize It! The yellow accent bar holds your names. 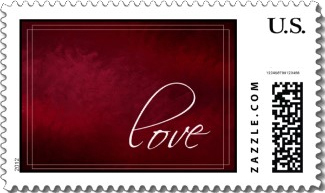 With an embossed image of "love" in the bottom left. Nice vintage look. 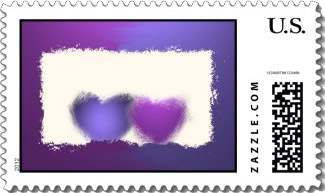 A modern illustration of two purple hearts of different shades overlapping against a background of white and framed in purple. 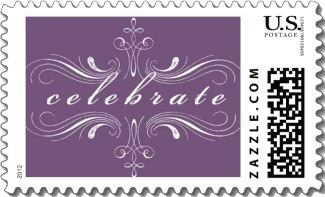 Stylish purple wedding stamp. 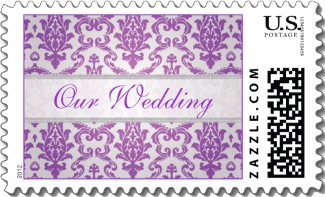 Wonderfully fun and modern purple damask wedding stamp. Personalize It! Easily include your monogram and your names in a white script font along the bottom. Very nice. 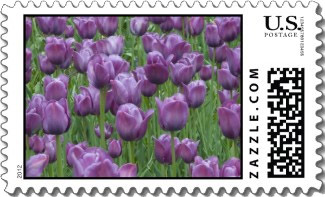 A field of purple tulips offset by their greenery. Perfect for purple spring weddings. Illustration of purple cherry blossoms on the left. Personalize It! with your names easily added to the right in a purple script font. 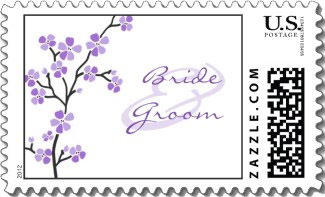 Plenty of white background for a simple and stylish purple wedding stamp. Personalize It! 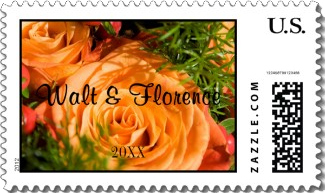 Easily include your names and date on this orange and ivory wedding postage stamp. Matching stationary is also available. Perfect for your Fall Wedding! A beautiful maple leaf in warm oranges with touches of gold is the backdrop for you to Personalize It!. 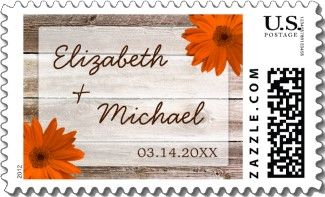 Easily change this orange wedding stamp to include your names and wedding date. Marvelous. 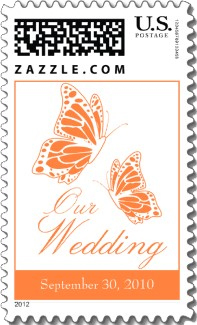 Modern and elegant tangerine orange and white butterfly on this orange wedding postage stamp. Personalize It! with your wedding date. Wonderful fall colors with an orange calla lily bouquet to the left against a dark red background. The text October Wedding. 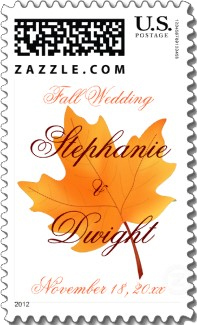 A classy October wedding postage stamp. Personalize It! 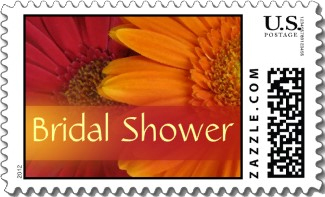 Easily put your names on this orange gerbera daisy wedding stamp. Matching wedding stationary available. Personalize It! 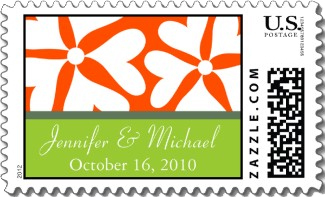 This orange wedding postage stamp has a place for your names and date in a white font over a light green banner. Illustrations of tropical orange flowers fill the top. 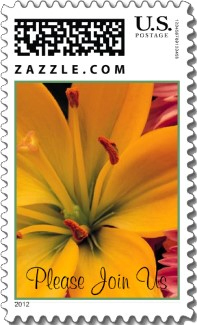 A close up look of an orange and yellow lily with the swirly text "Please Join Us" at the bottom. 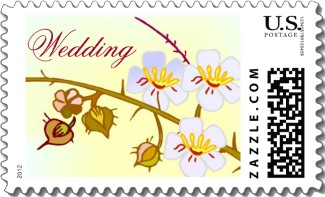 Simple and stylish wedding postage stamp. 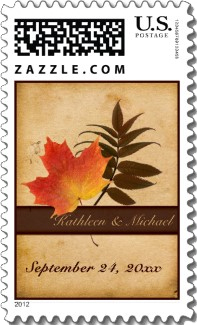 This autumn leaves on aged paper makes a lovely wedding postage stamp. Orange maple leaf sits above a brown band. Personalize It! Add your names to the brown band and your date at the bottom. Matching wedding invites and more. 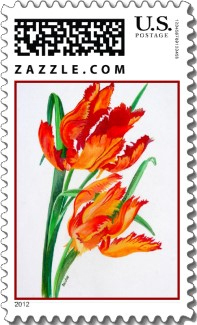 Beautifully illustrated parrot tulips in fiery red and orange along with their greenery. A wonderful orange wedding stamp. 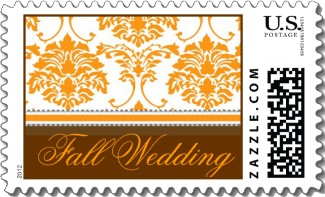 Orange and chocolate colored fall wedding stamp. Orange floral scrolls against white on top. Orange swirly font for "Fall Wedding" against the brown background. 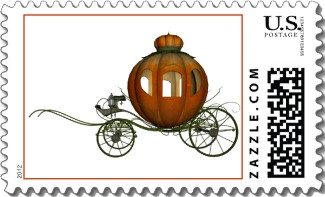 For your "Cinderella" story, this orange wedding stamp has an ornate pumpkin carriage. Very sharp. Harvest orange roses in a bouquet form the backdrop for this orange wedding stamp. Personalize It! with your names and date. 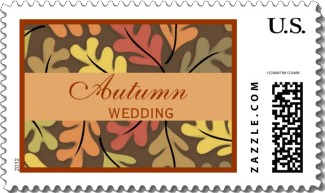 This autumn wedding stamp has a background of illustrated oak leaves in oranges, reds and yellows. Soft orange band through the center holds the text "Autumn Wedding". Compelling. Wonderful country and rustic wedding stamp. with a backdrop of barn wood. Personalize It! Center screen offsets your names and date in a fun script font. Orange daisies in the opposite corners. Very nice. Two beautiful fall flowers of deep red and gold orange with accent bar of gold and orange. Personalize It! Change the text to whatever you would like. 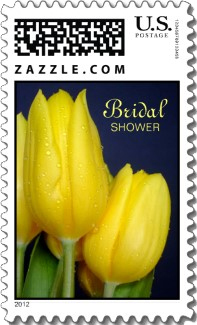 A simple and delicate yellow early spring wildflower postage stamp will be a stylish addition to your wedding correspondence any time of year. 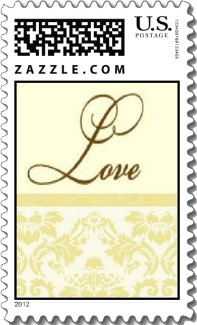 Stylish soft yellow damask wedding stamp with "Love" in a swirly font against a solid background. 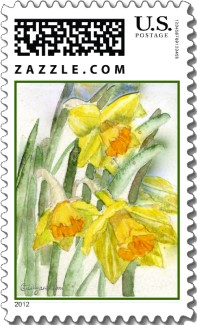 Wonderful watercolor painting of yellow daffodils fills this textless yellow wedding stamp. Extremely attractive and versatile. 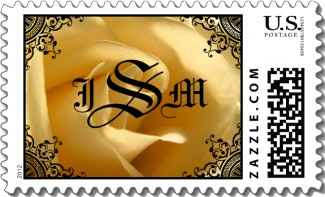 Wedding stamp with a yellow rose background overlaid with intricate black scrolls in the corners. Personalize It! The bride's and groom's monograms are easy to add. Delicate, warm and inviting illustration of cherry blossoms in tones of yellow and red. The text "Wedding" in the upper left in a swirly script font. 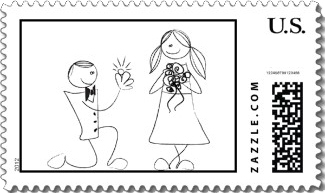 Fun wedding stamp. 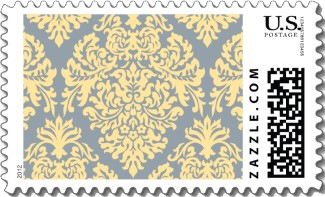 Yellow and soft gray patterns fill the frame of this yellow damask wedding stamp. 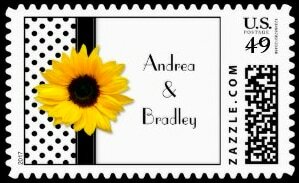 Stylized sunflower wedding stamp. Personalize It! The yellow background highlights your names and date at the bottom. Very nice. Yellow tiger swallowtail butterfly visiting colorful Spring flowers. A colorful Spring wedding stamp. Personalize It! 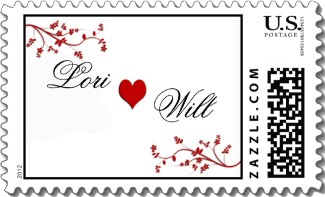 Easily change the text on this wedding stamp to anything of your choosing. Black background beautifully sets of the damp yellow tulips and yellow text. Beautiful and stylish, this yellow wedding stamp has delicate yellow daisies on top, a black and yellow damask design below. Personalize It! Banner through the center for your personal text. Quite lovely. 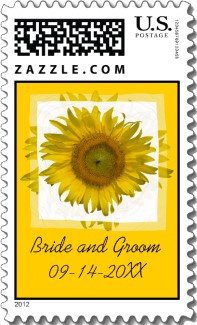 Sunflower on a yellow ribbon spans this yellow wedding stamp. Personalize It! Easily include your names and date in a black swirly font against the white backdrop. 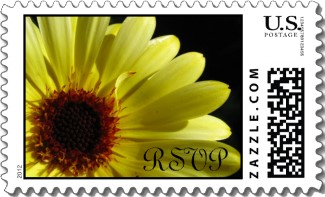 Soft yellow daisy nearly fills this wedding stamp frame against a black background. Black swirly "RSVP" text over the flower petals at the bottom right. Soft yellow background with white and yellow daffodil wedding stamp. Personalize It! Your names and date in a swirly black font near center bottom. Very lovely. 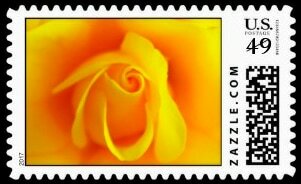 Unusually beautiful and stylish, this yellow rose wedding stamp has a striking yellow rose bud filling the frame. 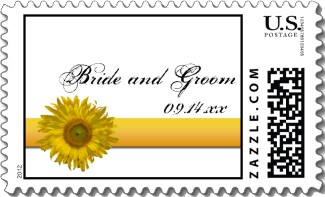 Fun, modern and clean style this yellow wedding stamp has a citrus yellow sunflower and black polka dot background to the left. Personalize it with your names in a modern Parisian black font. A stylish variety of fonts are used in this classy black Save the Date wedding stamp. Personalize It! Update with your names and date. 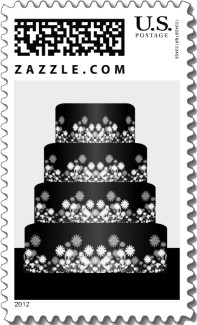 Black and white four tier wedding cake fills the frame of this wedding postage stamp. 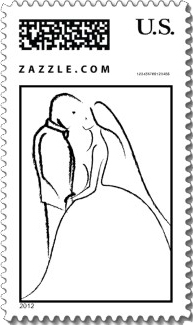 Funny and humorous wedding stamp. 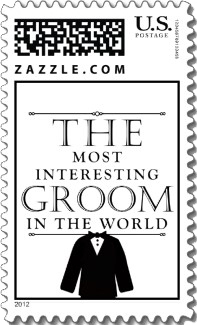 White background with the text "The Most Interesting Groom in the World" in a black blocked font and a small black tuxedo at the bottom center. 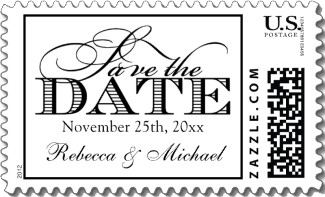 Elegant and stylish, this Save the Date wedding stamp uses both swirly and engravers fonts in black. Personalize It! Your names and date easily substituted. Vintage art deco design with a light gold pattern and your names prominently centered on a black background. 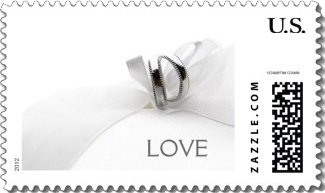 Classical and stylish black wedding stamp. 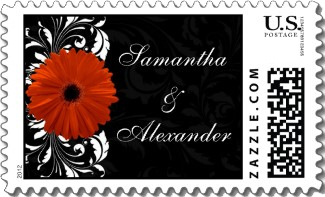 A stylish black wedding stamp with ornate gray damask and floral baroque design. 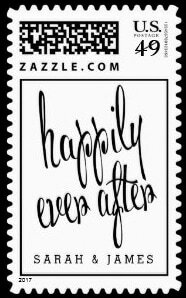 Stylishly simple with the black script text "Happily Ever After". 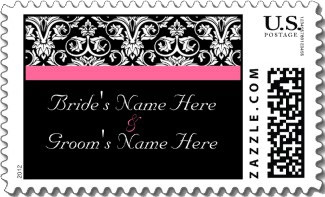 A fun white and black wedding stamp. 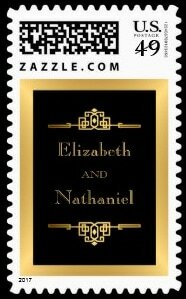 Elegant art deco wedding stamp in black and gold. Personalize with your names. 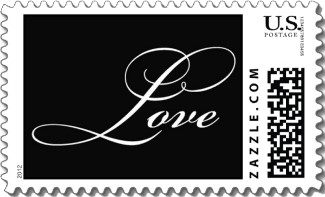 All black love wedding stamp with elegant white scrolls top and bottom and "Love" centered in an offsetting block font. Very lovely. This black wedding stamp has the entire frame filled with black and the white text "Love" in a swirly script font. Simple and classy. 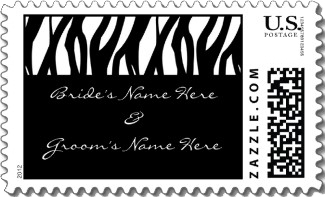 Bold and striking modern contemporary black wedding stamp with accents of funky but classy vertical zebra-like stripe element. Personalize It! Include your names in a white swirly font or any text you prefer. A single long stemmed red rose, the symbol of love, against a black background. Personalize It! Your names or any other text to the right in a swirly stem-green script. 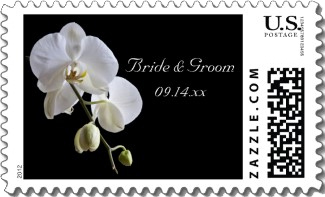 Tasteful and elegant white orchid against black wedding stamp. Personalize It! Your names and date in swirly script white font. A classic look. Beautiful gold and peacock feather treatment against black. Personalize It! Your names and date in swirly script gold font. Very sharp! Matching invitations, too. 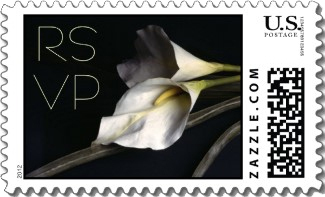 Beautiful cream calla lilies against a black background with "RSVP" stacked in a modern minimalist font. Very appealing. Easy add and embellish your colors on your wedding invitation with any of these customized stamps grouped by color category. From the deepest purple wedding colors to the sunniest yellow wedding colors, you will find your perfect wedding invitation stamp.